All officers from the rank of Assistant Superintendent of Police (ASP) to Inspector-General of Police, will henceforth declare their assets, the Acting Inspector-General of Police, Mr Ibrahim Idris, has declared. 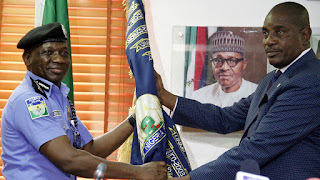 Idris made the statement on Thursday in Abuja when he paid a courtesy visit to the Minister of Interior, Lt.-Gen. Abdulrahman Dambazau (retd). He said that the directive was in line with Section 13 cap 15 Code of Conduct Act. “Every police officer from the rank of Assistant Superintendent of Police to Inspector-General who are commission officers must declare their assets,“ Idris said. “I assure you sir, that we will raise the integrity of the Nigeria Police Force to be more accountable to the people,“ he said. He said that the presence of police officers would be felt in all villages and streets across the country. “You have a lot of challenges as the chief law officer of the country,“ he said. The minister urged the new police boss to collaborate with other security agencies to address the issues crimes and post conflict resolution in the North-East. “The post conflict resolution in the North-East has to be comprehensive and holistic,“he said. “No matter how smart you think you are, you cannot do it alone without the support of others,“he said, and advised Idris to make the welfare of his officers a priority. In his inaugural speech, Idris said that the police under his administration would be guided by the international core values of policing.